The National Venture Capital Association (NVCA), comprised of more than 400 member firms, is the premier trade association that represents the U.S. venture capital industry. NVCA’s mission is to foster greater understanding of the importance of venture capital to the U.S. economy, and support entrepreneurial activity and innovation. The NVCA represents the public policy interests of the venture capital community, strives to maintain high professional standards, provides reliable industry data, sponsors professional development, and facilitates interaction among its members. Venture capital has enabled the United States to support its entrepreneurial talent and appetite by turning ideas and basic science into products and services that are the envy of the world. 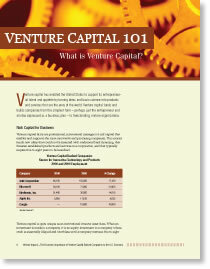 Click on the link below to download an informative introduction to venture capital and the role it plays in our economy.